Alayne saw that view of blind Jake poking his head out of a hole and sent me in for the camera to get the shot. It’s hard to believe the hole was deep enough, or big enough, to swallow Jake’s rather large hound body, but there he was, with only his head above ground. And, while each yard has green grass, cots, and dog houses, there is still nothing better than a?good old-fashioned hole?… as?Jake will be happy to tell you. In light of the Labor Day holiday next Monday, I’m going to take a blog break that week?and will resume posting the week of September 14th. Alayne and I just started the second cutting of hay (first cutting was over July 4th weekend), so hopefully by the time we’re back on the blog, we’ll be done with haying for the year! Love you Jake. One of the old timers!! Your hard work is 24/7. Thank you Steve and Alayne.. Enjoy your “break” everyone. Although it’s sounding like some pretty intense effort there. I so admire ya’ll for everything you do. Right now I am going next door to feed and water and take care of a dog I call abandoned. The house burned down in Dec. and he started rebuilding a few months later then it came to a stand still for a while now. The dog is tied to the end of the house and he might come around once a week. The dog would be without water and nasty food. I texted him about it but he didn’t answer. About a month ago I started going over there and taking care of the dog. I have cut huge mats of hair out. T he food bowl was nasty and had ants. I did go to the chief of police and he said he would go take pictures and it could go to court but I asked if it to go to a please don’t because she would be put down. I wish he would give her up but I can’t take her because one of 4 would be aggressive. I’m trying to find a place cause I will steal her. He comes there but doesn’t even check on her. H e could care less. I fell and injured my arm there today but I won’t quit. Wow, that hole must be mighty big! He’s a big guy and it’s hard to believe only his head is showing. And it’s a funny shot, at that. That is hilarious!! Have a good holiday break. 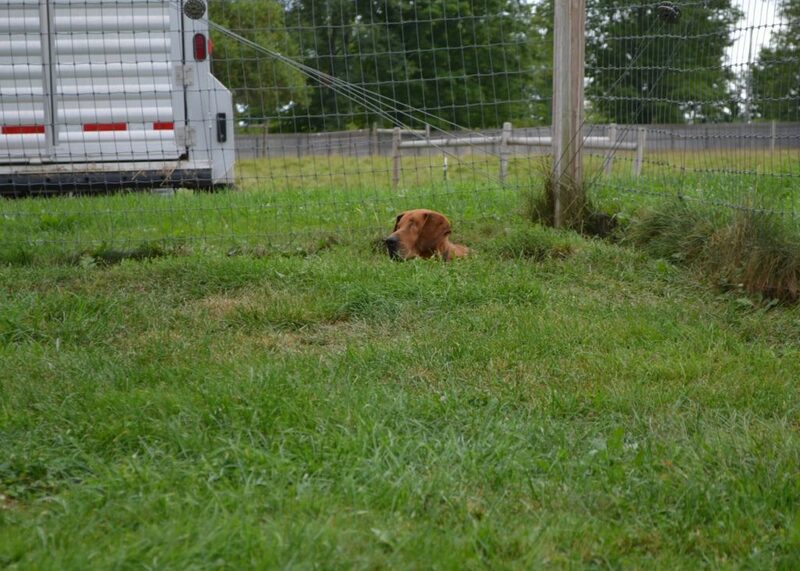 How funny he looks poking his head out of that hole….I could see Owen being swallowed up in it! He can now walk around my yard on a leash without hitting too many trees!!!!! And Suzi just explores in a small area…They both are true blessings!!!!!!! Thank you for all you do <3. He’s so cute! To Sheila, please take pics and take him to court and say you can take the dog, then they won’t put him down. I just had a similar experience for the past 5 years and the dog finally died the beginning of summer – but I couldn’t do a thing for reasons too long to go into here. There are good judges and just fill out a complaint and talk to the judge! Good luck! Nothing beats a nice cool hole! I hope you have time to relax a little after the haying is done.